Reading for fun and challenging myself to read outside my comfort zone. It is almost the end of January and I have read 13 books. I am pretty proud of myself, so I am going to pat myself on the back for just a minute. 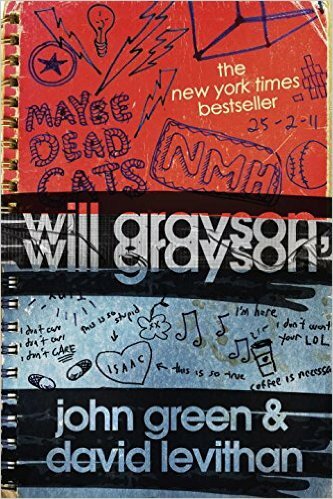 This is a story of a boy - named Will Grayson who meets another boy named Will Grayson. One Will is straight, and one is gay. They run in two completely different circles. Once they meet, their lives intertwine. The story is told by the points of view of both Wills (one chapter was straight Will, the next - gay Will) and even though they are from different sides of the tracks, they both experience love and sadness and friendship in the same way. This was a pretty good book. I like one book that John Green wrote, and I find myself trying many of this books. 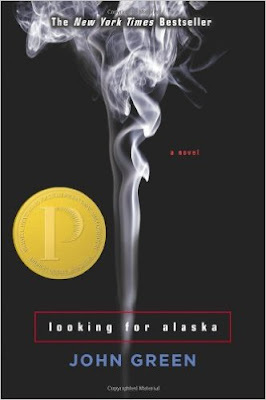 This one was better than "Looking for Alaska", but not as good as "Fault In Our Stars". I loved one character in this book - Tiny Cooper. We never really learn what his actual first name is, but Tiny is huge. Over 6 feet tall and 300 pounds. And gay. He becomes the common factor between the two Will Graysons and the reason their lives intertwine. The book ends on a high note, but I do wish it would have gone on a few more pages. It doesn't really tell me what I wanted to know about one of the Will Graysons - even though I think it is implied. But I felt unsure, so I felt a little let down by the end. Also - there is quite a bit of swearing in this book. It is a YA and I think of my own almost 13 year old and think I am not ready for her to read these books yet. She probably hears enough of it on the bus to fill a book on its own, but I think that for YA novels - they could keep the swearing to a minimum. It doesn't add to the book at all. A few is one thing, but this one was worse than most. Now that I have given my "mom" thoughts on the book, my final word is - give it a try. 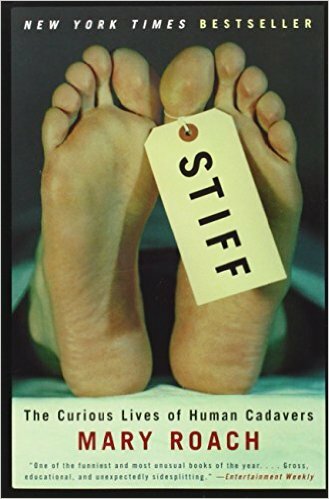 This is a non-fiction book about different avenues cadavers can take after a person dies. The author explores bodies donated for science, bodies cremated, bodies used to test car crash survival, bodies in religion, bodies whose organs are donated for transplants, and more. She gives a good history of how many of the post-life practices began and how far we have come. This was a great book. Yes, I am a nurse and the human body is completely fascinating to me, but I think a non-medical person would enjoy this just as much. Did it have a few cringe worthy paragraphs? Of course it did - it is about cadavers. But overall, it was well written and the author did her homework. I would have never thought about donating my body to science before this book, but now I see how much there is to gain with that option. Although, I don't want to be a crash test dummy. And that is a choice. It is amazing what you can learn from a body after a person dies. We would not be as far as we are in organ transplantation as we are now if someone didn't donate their body for doctor's to learn. We would not know what happens to a body after the brain dies if we didn't have people who permitted their brains to be studied postmortem. If what they learn saves my life or a life of my loved ones, then those cadavers are my heroes. Check this book out. It really was a great learning experience. This is a true story written by one of the climbers that was on this trip in 1996. He is a reporter, but also an avid climber, and had always wanted to climb Everest. He got the people at his magazine that he wrote for to fund his trip (did you know the trips cost $65,000? And that was in 1996) and so he went. The book tells of his trip, and what happened to cause the death of 5 people on that trip. I liked this book. 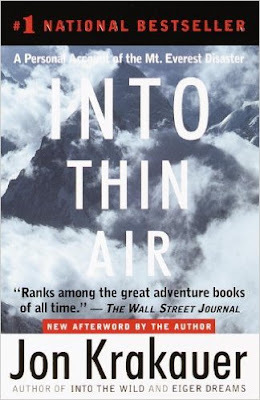 If nothing else it taught me that people who want to climb Everest are borderline crazy. If not completely insane. The account from the author makes it sound terrible - every single second. From getting altitude sickness to major frostbite to cerebral edema to death. He talks about being so deprived of oxygen that he couldn't think straight when it was most critical. And how he lost so much weight for having to work so hard that he almost froze to death. And the Sherpas. The people who live at the base of Everest who are hired to go on these climbs and set the ropes and carry the loads and care for the people who paid for these trips. There are no words for how awful their jobs are but how they don't see it that way. These mountain climbs of things of honor for them, but I felt nothing but terrible for them. Many of the people on these trips have families that they leave behind to climb a mountain. And die trying. They are not fighting in a war for their country. They are not putting themselves in harms way to save the life of another. They have paid an exorbitant amount of money to have a team help them climb a snowy mountain. It seems beyond silly. But I am getting off track. The book was well written and definitely worth the read. He tells the good with the bad (mostly bad if you ask me) in taking on a climb to 29,000 feet. This is the story of a rich man named Jay Gatsby who is trying to reach the love of his life - Daisy. The story is told by Nick - Gatsby's neighbor - who becomes his closest friend and confidant. Gatsby approaches Nick to have Daisy come his way so that he can reconnect with her. 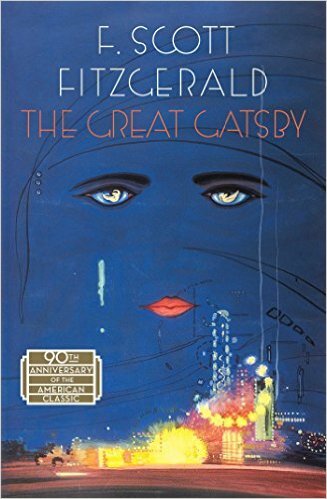 Gatsby is much wealthier than he was when he last saw Daisy, so he hopes this will attract her attention. Daisy is used to a life of privilege and she is now married to Tom to continue this way of life. Tom is not a faithful husband, and so Gatsby hopes this will lure her away from Tom. In the end - the love triangle spirals out of control and has a tragic end. But I won't share with you what happens because you should read for yourself to find out. I liked this book okay. I am not a huge fan of books from this period (gasp), but it wasn't terrible by any stretch of the means. I found Gatsby and Daisy shallow, and couldn't really muster up pity for either one of them in the end. Daisy especially seemed like a total flake and I found myself making faces and shaking my head on some of her lines in the book. It isn't a long book, so I am glad I took the time to read it. Now I have. But I don't think this would be one I will be reading again. Did you know this novel was published in 1895? And that HG Wells coined the term "time machine"? These are your fun facts for today. You are welcome. 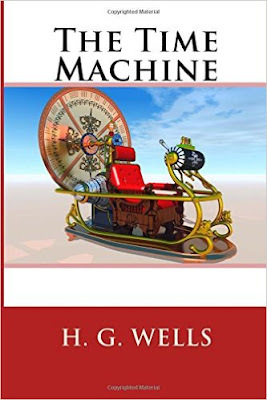 This book is about a Time Traveler (who is never named in the book) who built a time machine. He travels to the year 800,000+ and stays for 80 days there before returning to the 1800s to tell his tale. The book is mostly the Time Traveler telling his friends of his experiences with the people in the distant future (who are named the Murlocks (undergrounders who only come out at night and are dangerous) and the Eloi (overlanders who are out during the day and are child like). He falls for a girl named Weena who he plans to have return with him to the 1800s, but it was not to be. The reason he spends so much time in the distant future is because the Murlocks have hidden his time machine and he needs to figure out how to get it back. Once he does, he actually goes forward in time - curious to see what happens to the earth millions of years into the future. Once he travels to the end of time, he reverses his course and goes home. Do his friends believe him? Does he stay in the past? Does he prove his travels? You will have to read to find out. I did enjoy this book. I found the part of him going to the end of time especially gripping. Wondering always, as we are, what it will be like when the earth is no more. HG Wells theories are not far from what science believes today. The air is thin, the earth is quiet, and life is basically non-existent. No reason to stay. This book is really (really) short. I have a small copy and it was 120 pages. If you get a typical sized book (like the one they sell on Amazon) it is only 58 pages. A quick, yet enjoyable, read. While I am reading my next book, I wanted to state that I am adding another 24 books to my 50 book challenge. It is a weird number. Book Riot's Read Harder Challenge is what another one of my friends is doing (along with the 50 book challenge), so I thought why not. I have already read 8 books and it isn't even the end of January, so I think I might be able to add a few more. Here are the categories and the books I chose for the extra 24 books. We will see how far I get. Last year I read 58 books. Think I can beat that? I think I can. If you click on the title of the book, it will take you to its Amazon link, so you can read about it if you so desire. 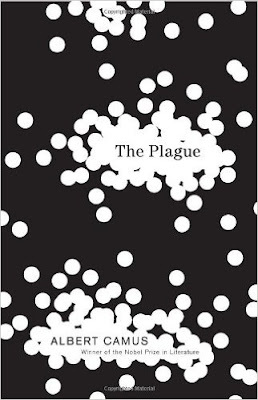 This book was about a bubonic plague that struck a North African town called Oran. The people in the town ignore the signs that what is going on is a plague until over 300 people are dying a day. A Dr. Rieux finally convinces the town's authorities that there is definitely a problem and they gate off the town. No one can come in and no one can come out. Dr. Rieux has just sent his unwell wife off to a sanatorium before the plaque broke out, and now his mother - who he called to help him in his wife's absence - is in the town with him. Dr. Rieux and several of his companions work 20 hours a day to try and help, but what really happens is they watch helplessly as 100's of people die. In the end - not all of the main characters survive the plague, but the town does come out on the other side and opens its gates once again. This is a pretty good book. It took me awhile to get into it because it is intense. I found that like some other books, I couldn't have the TV on in the background or I found myself re-reading passages several times. It was not a difficult book, it just requires your full attention. The main characters are great, and each of them struggles to find the meaning in the plague. The book makes you think about what you would do if the plague to place in your own town. Would you try your best to get past the gate and get out (like one character did)? Would you hide? Would you help? These days we live in a world of immediate over reaction, that I wonder what the majority of people would do in this case. I think it is a book worth reading. It is an old book, but I recommend picking it up and making it one of those books you read in your lifetime. This is a story of Miles (who gets nicknamed Pudge in the book) who goes off to a boarding school in Alabama. He didn't have much of a social life in high school, and he was glad for the change. His new roommate Chip (nicknamed "The Colonel) is a super smart, poor boy who loves to prank others. Alaska, is the beautiful, tortured girl that Miles falls for. He, Chip and Alaska quickly become friends (along with another guy), and for the first time, Miles has friends he can count on. Then a tragedy occurs leaves the circle of friends rocked to their core. They are left in grief and confusion and spend the rest of the school year trying to figure out "Why". This was a pretty good book. I loved "A Fault in Our Stars" and how John Green wrote. So many great lines in that book. This is his first book, so I didn't hold it to high expectations. IT was enjoyable, and very short. It is a Young Adult book, and I did find myself rolling my eyes at some of the things the teenage characters said and did. The Colonel (Chip) was my favorite character in the book. He was funny, and had some of the best lines. Alaska was a bit of a tease and really not that developed of a character as you would expect. The characters just didn't really act their age. Sometimes they acted quite a bit older and said things you know no teenager would ever say. And other times, they were so immature you thought they were more middle school aged. It was all over the place. You do know something big is coming from the beginning of the story - you just don't know what it is. I have to say, when I got there, I was surprised. Well, when I got NEAR there, I was surprised. There were a few hints a few pages before, and I had my theory. But at the beginning (the titles are called "180 days before.....76 days before......") I wasn't sure what was coming. True love? Expelled from school? The author did well keeping it a secret. I am a little torn. There were parts I liked, and parts I didn't. I found myself skipping small parts of the book and thinking "yeah yeah yeah". If you like John Green, and are looking for a quick read, then give it a try. It isn't terrible. And you may find it better than I did. It did get 4000 reviews on Amazon, and 86% of them were 4 or 5 stars. So there is that. A long weekend with a small snow storm means lots of time for reading. This book is based on the quote "Everybody is smart in different ways. 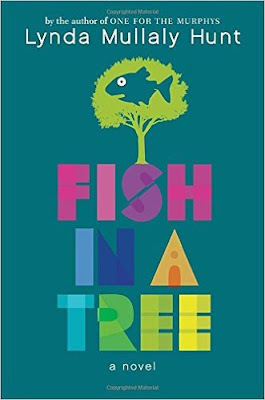 But if you judge a fish by its ability to climb a tree, it will live its life believe it is stupid". The main character is a 6th grader named Ally. She has spent her whole life struggling to read. Instead of admitting she has a problem, or knowing that she isn't dumb, she just needs help - she avoids school work to the point of getting into trouble. She doesn't have any friends, and the class bully has it out for her. Her teacher leaves on maternity leave, and in comes a new teacher - a Mr. Daniels. He realizes right away that something is wrong with Ally and starts to get her the help she needs. Ally starts to make friends - a tough girl named Keisha and a smart boy named Albert. She gains confidence, and she realizes that it is okay to be different. This was a great book. It had a valuable lesson. It shows that some kids who have an underlying diagnosable problem can be labeled as "trouble makers" and never given the help they actually need. But when that help is given, they thrive and become the people they are supposed to be. It made me think a lot about Finley's teacher that she had last year, Mrs. Holm. For two years, Mrs. Holm made Finley the person we knew she was underneath all the anxiety and worry. She gave her the tools she needed to become a confident learner, and showed Finley that she isn't alone in her struggles. That there are adults that will be there to help. Good friends that will be by your side. We will always be grateful for that. I really liked this book. It wasn't a very long book, and it was written on a level for you tween/teen. (my daughter, Arlington said their teacher read it to them in class). But the message was great, and I recommend it. This book is about a set of twins named Cath and Wren. They are going off to college for the first time. Wren - a free spirit who wants independence, tells Cath she doesn't want to be roomates at college. Cath, who is an introvert who writes fanfiction about characters in her favorite book, is now completely on her own and terrified. She ends up with a roommate she isn't sure likes her and her boyfriend that is always around. She is taking a junior level Fiction Writing class with a professor that hates fanfiction. And she hasn't made any friends. She spends most of her time worrying about her dad who has been alone since their mom left when Cath and Wren were 8, and he has a diagnosed bipolar disorder. Cath is not sure she can survive without her sister by her side and not even sure she wants to. The book is pretty fun. I read Eleanor and Park - another one of Rainbow's books - last year, and really enjoyed it. This book did not disappoint. Yes, it is a YA novel. I read quite a few of those actually. Mostly because they are easy reads, but also because a lot of Arlington (my almost 13 year old daughter) has friends that read these books, and I want to see if they are appropriate for her age group. This one I would say is/isn't. I am not really ready for her to read books with so much language in them. (although, she would tell you she hears it each day on the bus). But other than that - it is PG-13 material. Cath - the the main character - makes you want to punch her in the face. Just a little bit. She is witty, but she is also a total hermit. She doesn't smile much, she doesn't socialize, she barely talks. She is stuck in a fanfiction world of a book series that would be like Harry Potter in her world. She wants to be a writer, but she only wants to be a fanfiction writer because it is easier than coming up with her own ideas. She chooses not to do a project for her Fiction Writing class because she just doesn't feel like it. Seems a bit......immature. She is 18, but I don't know. I would be horrified if I didn't do a project in college - would never have thought about never turning it in at least. There is a love story. And it is a pretty great one. The boy she falls for is a great guy, and you are rooting for him the entire time she is deciding how she feels about him. And there is family struggle. These girls have a lot of deep seeded issues since their mom left, and they start to surface in full force now that they are alone in college and trying to figure things out without the other twin to lean on. I recommend the book. It had some really funny lines, and it was a pretty easy read. Check it out. This is the most I have read in the month of January. I am proud of myself! This book covers 30 years of time in Afghanistan. The story is mainly about two women named Mariam and Laila and it follows them from childhood to adult hood. The book starts with the Soviet invasion and ends with the overthrow of the Taliban. The women are separated in age by about 14 years, but when Laila becomes a teenager, they are thrown together in a situation that brings them from being enemies to sisters. Along the way there is love, heartache, and death in both of their lives. It is hard to describe too much about this book without giving away the plot, but I think this might be my favorite book of this year. It is going to be hard to beat, and it is only January. The Kite Runner was magnificent and ended up being my favorite book last year, and this book as equally as good. I had a hard time putting it down wanting to read just one more chapter. There is a love story for Laila that you fight for when the boy she loves is torn away from her. 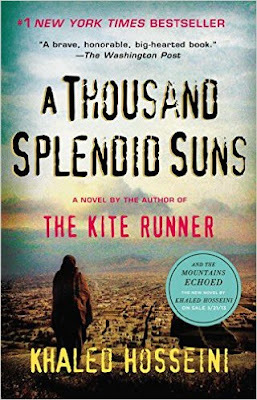 There is heartache for Mariam that you wish she could escape from, but she never can. And you learn a lot about what it was like for Afghani women during this time and are thankful for living where you do. Run to get this book. It is a must read. 3 down, 47 to go. 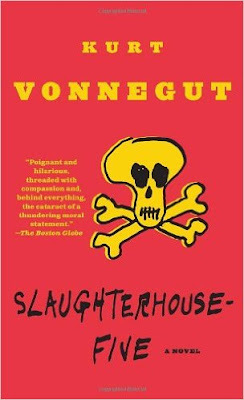 This book follows Billy Pilgrim - a soldier who believes he was abducted by aliens. He believes that through these aliens he has learned to time travel forward and backward throughout his life. Many times he travels back to World War II where he was a prisoner of war and held in slaughterhouse five in Dresden, Germany. We learn about his life as a child, whom he married, that he became an optometrist in a successful practice, and where he was when he died. There are many true aspects of this novel mixed in with the fiction. The author of this book was held POW in Dresden. Over 100,000 citizens were killed there in a bombing, and he survived as a prisoner. The main theme of this book seems to be fate. The author speaks of it several times. The aliens speak of it as well. They tell the main character, Billy, that they know how the world will end, but they will do nothing to stop it. I thought it was a pretty great book. Not something I would have ever picked outside of this challenge because the title - just not sure what I was going to read. But I really liked it. It is a pretty short book (only 215 pages), so I may re-read it again someday. It was a great book about time, space travel, death, war, and human behavior. I hear there is a movie, so I might give that a try. Another book down! This one was an easy read, so I was able to finish it quickly. This is a world where there are no more taxes and the government has been privatized. The employees take the name of the company they work for (for example - Hayley McDonalds and John Nike) and when they change jobs, their last names change as well. 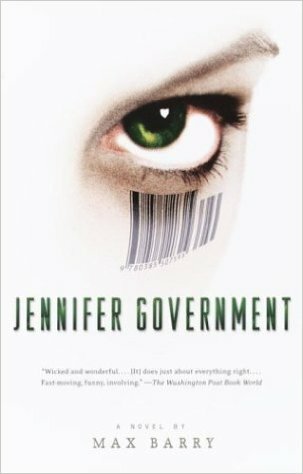 Jennifer Government, well, works for the government. Jennifer is a single mom and a government agent who has to get funding before she can fight crime (if you want your lost loved one found, or a crime solved, you have to pay the government to do it) In this world, the US controls not only the western hemisphere, but also Australia, England and Japan. The plot goes from Australia to London to US and back again trying to chase a cyberterrorist and people who are manipulating the stock market. The book represents capitalism at its worst, and how strange the world really could be. The book was an easy read. I found it entertaining and the names of the people in the book were humorous. There was a little love story, and chasing bad guys, and in the end there was justice. There were mixed reviews about it on Amazon, and I can see the points those folks make. It moves pretty quickly, and there isn't much time for deep character development, which can leave you confused. But mostly it was entertaining, so I say give it a try. A new year has started, which means it is time for the 2016 book challenge! I have been looking forward to starting the new year and the books I have on this year's list. This book is about an alien invasion. There have been 4 waves to this invasion so far: darkness was first - all electricity was cut. Then what followed were earthquakes and tsunamis which wiped out around 3 billion people. The 3rd wave was a plague which wiped out about 4 billion people world wide. 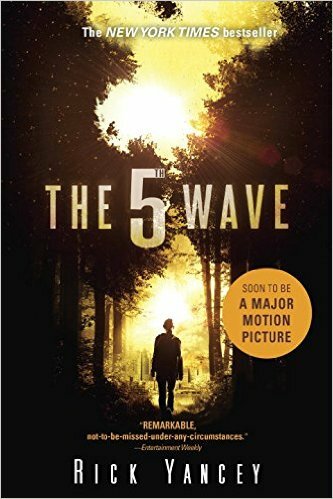 The 4th wave is where the book starts - they are in the middle of it. The "Silencers" (aliens) hunt humans and kill them on sight. Our hero of the story, Cassie, is on her own at the time of the start of the 4th book. She gives us glimpses into the past - what has happened up until this point, what has happened to her family, and how she is managing to stay alive. Cassie is alone a long time until she is wounded badly, and she meets Evan Walker. He nurses her back to health, and offers to help her rescue her brother. She decided to trust him even though she isn't sure he is human. The story unfolds nicely. It is a YA novel, but I thought it was pretty good. We don't find out what the 5th Wave is going to be until near the end of the book (because, folks, this is a trilogy series), but things unfold during he book that helps you guess where it is going. Cassie, the main character, is a strong female lead (and a 16 year old) whose love for her little brother keeps her from giving up. 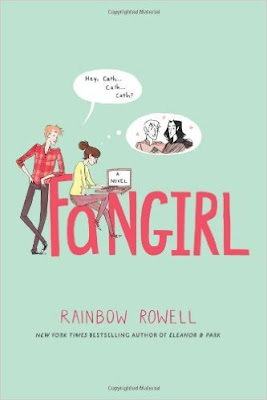 Yes, there are mushy teenage moments, but what YA novel doesn't have that? I don't think it took away from the story at all. I am anxious to see where this series is going. I think I am going to have to sneak in reading the second book even though it isn't on my challenge list.